Not all that different from the previous novels so far, except for Rourke running into some crazy people. Gun names, other gear names, badass survival, etc. One problem with these novels is that they repeat too much that has already been said in the previous books. We all know by now what his favorite pistols, revolver, shoulder holster, and assault rifle are. We know that his son looks like him because his wife thinks it 1,000 times per novel and the author tells us. The author isn't good at characterization, and uses repetition in its place. If you took this stuff out, I think you could combine the novels and reduce the number in the series by half. That said, I do find it interesting that the Soviet characters are not all cartoonish villains, which is something one might expect when first engaging with this type of novel, especially given the time period in which they were written and when the author grew up. But while they Soviets, like the protagonists, are only one or two note characters, he's gone out of his way to present several of them as fairly decent people. He certainly gets props for that instead of simply giving us repeated incarnations of Boris and Natasha. 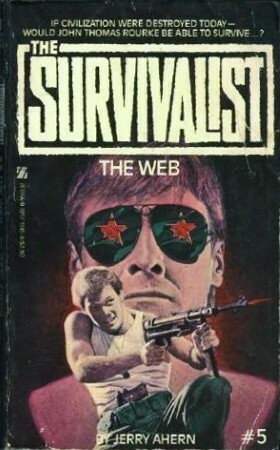 The Survivalist series is interesting and it appears to be one large book broken down. To my knowledge the series consists of 27 books. I'll quit my job before they make me work on another Survivalist. I'm going to spoil this book for everyone. John Rourke kills brigands. Sarah Rourke loves her kids. The end. See my review under "Total War," Survivalist Book 1. Jerry Ahern - Jerry Ahern (born Jerome Morrell Ahern) was a science fiction and action novel author best known for his post apocalyptic survivalist series The Survivalist. The books in this series are heavy with descriptions of the weapons the protagonists use to survive and prosecute a seemingly never-ending war amongst the remnants of the superpowers from pre-apocalypse times. Ahern was also a firearms writer, who published numerous articles in magazines such as Guns & Ammo, Handguns and Gun World.Jerry Ahern passed away on July 24, 2012 after a long struggle with cancer.Ahern also released books under pseudonym Axel Kilgore.